This blog will highlight the restocking of warehouses. Many companies will use process such as main stocking warehouse, as well as line-side production or picking warehouses that need to be replenished. There may not be enough physical space in these locations or material may not need to be there until it is ready to be used, so warehouses will purchase and stock material in one warehouse and transfer it to the other. Refilling warehouses can help automate the generation of that transfer based on demand. This post won’t talk about other replenishment strategies such as those used in Advanced warehousing, but will show the basic Master planning refilling automation. In the example above, this shows a rule for Warehouse 11 to supply Warehouse 12. So if there is demand for an item in Warehouse 12 and not enough inventory on-hand or on an open transfer, a planned transfer order will be generated to let the warehouse know to pick the material required and send to Warehouse 12. This alleviates the need to manually create transfers or alert personnel through unnecessary phone calls or emails. And as I’m sure you already know, transfer orders support picking activities just like sales orders. One quick thing to note is that the above rule applies for the entire warehouse. If the transfer rule applies only to specific items, that’s where you want to specify planned order types per warehouse in the Item coverage of that product. 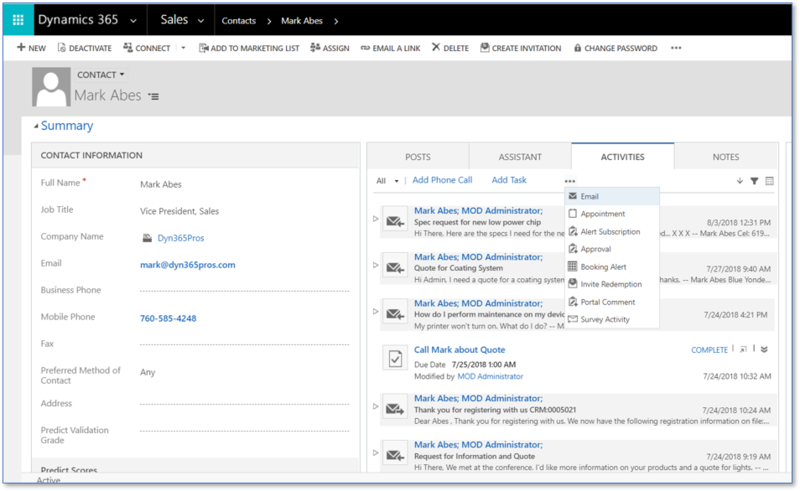 Microsoft Dynamics 365 Customer Engagement consists of a scheduling engine that allows to enable scheduling for any entity, even custom entities. It’s used to find the best resource based on a set of different variables for example availability, skill set and location. Let’s start by navigating to Universal Resource Scheduling app – scroll down to Administration in the sitemap and this is where we get the Scheduling Setting and choose Enable Resource Scheduling for Entities to proceed. Another option is to navigate to web.powerapps.com to create these relationships in a solution with a publisher (and therefore prefix) of your choice. I create a 1:N relationship to the Bookable Resource Booking entity and one 1:N relationship to the Resource Requirement entity. Lets try to Publish it now!!! After publishing is completed; We got the Book option in the command bar to appear on my Evententity. What happens if we would choose Book at this point is that a Resource Requirement would be created in the background and the Schedule Assistant would try to use the Resource Requirement to find the most suitable resource available for my Event. But the Resource Requirement would not contain any data from the Event entity and therefore not actually help it at all. 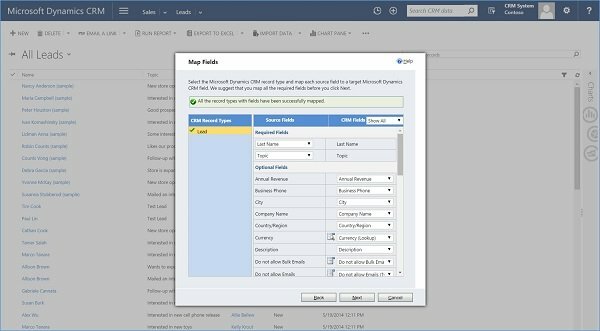 This blog highlights; how to change the number of rows on a grid in Microsoft Dynamics 365 for Sales CRM. Generally, you will see up to 50 records on a grid. But dependent on your needs, maybe you want to increase or decrease that number. Doing so is not difficult if you know where to look. 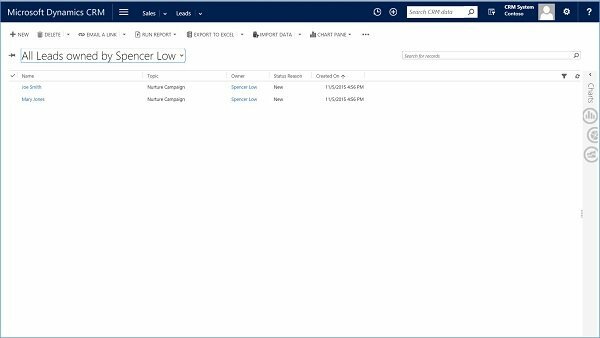 Let’s see how to change your personal options to control the number of rows on a grid in Dynamics 365 for Sales. I selected 50 rows per page, You can also choose to display 75, 100, or 250 records per page. Your grids will now display the number of records you have chosen. This blog outlines the execution of HR and payroll processing easier and full of ease. Dynamics 365 has been launched by Microsoft to simplify the payroll processing burden from the employers and helps them save time and the costs. Dynamics 365 provides businesses with the opportunity to achieve maximum flexibility in all their operations relate to HR payroll dealing out. In order to generate earning statements there are multiple options available. One can either use the form in HR payroll module titled as “Generate Earnings” or create each earning statement separately or through integration. After generation of Earnings Statement you can either release the statements separately or you can choose “All Earnings Statements”. And after this step, a pay or earnings statement is generated in Dynamics 365. After thoroughly reviewing pay statements, the next step is to release these pay statements. There are two ways this step can be completed. One can either release pay statements separately for each employee or through the main grid, they can select multiple pay statements, this is then followed by the submission phase where the user has to choose the Submit for Payment option. Every time this option is selected, a payment journal will be created. After submitting for payment, a form will appear on the screen in which the user will confirm their submission. This confirmation will post the payment statement at this very instant. A wise approach is not to post the payment because after posting the pay statement, no changes can be made. 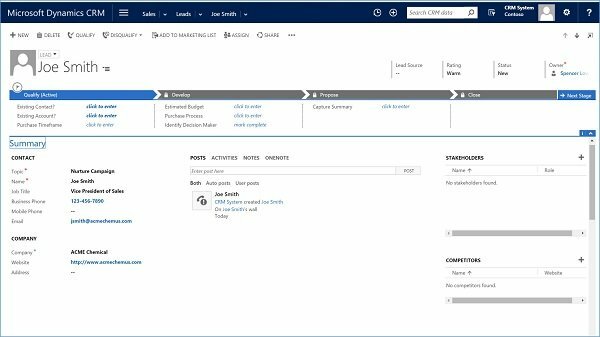 This step is not carried out by the user but Dynamics 365 itself creates the payment journal. The processing of these payment journals has to be carried out by the user. For this purpose, the user must navigate to the payroll option and choose pay statement processing followed by the selection of the option titled “Payment Journal”. This allows the user to process any journal they want to. After the processing of the payment journal is done and the payment is made, now you can easily post the pay statements. For the posting of the pay statements the user simply has to go back to the payroll option, choose post pay statements and it is done. Finally, Setting the pay cycle is the last step of the entire process, Dynamics 365 HR payroll system will automatically post the pay statements that fall into the criteria set by the human resource department. Here the period is defined to set the pay-cycle. 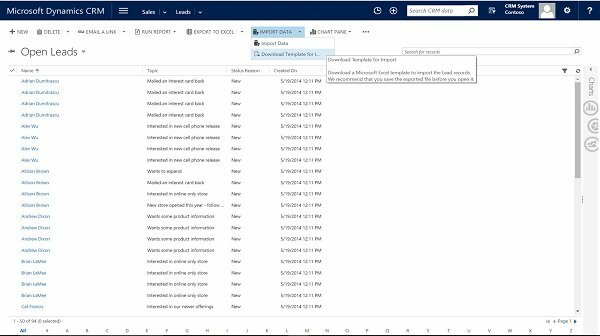 Dynamics 365 – Task Recorder Screenshots… Extensions. 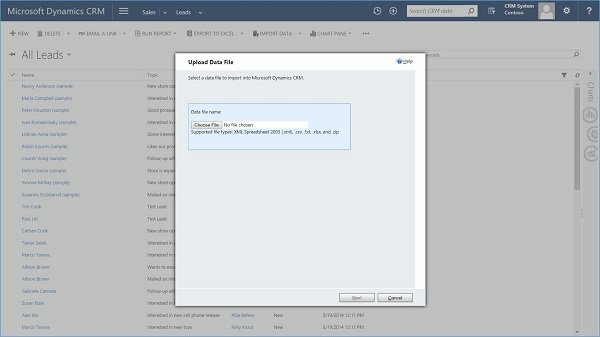 In Dynamics 365 for Operations, Microsoft suggest that you need to add an Extension to Google Chrome in order to the screenshot option while making task recorder documentation in D365 for Finance and operations. Select Download and Download Zip. Unzip the file and save it in a folder. Browse the folder, select” TaskRecorderSchreenshot” folder and press OK. The extension is now added. Make sure that “Enabled” is selected. Restart Google Chrome. When Google Chrome opens again “Disable developer mode extensions” opens. 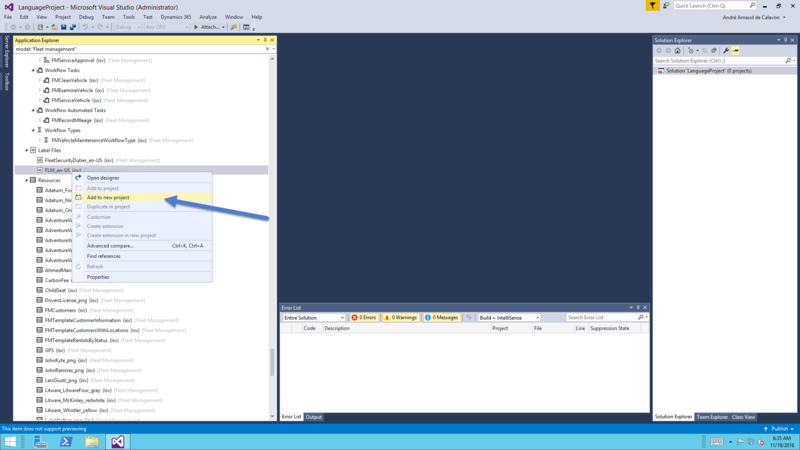 Select “Cancel” if you want to use the Task Recorder screenshot extension. As Microsoft Dynamics 365 for Operations now comes with a license per named user instead of purchasing modules, the license requirement has been removed. In addition, the license was controlled using a pre-defined list of codes and not all languages were included. Also, we got rid of the Dynamics client and development workspace, as the application now runs in an internet browser and development is fully moved to Visual Studio. So, the only left is the label language file. 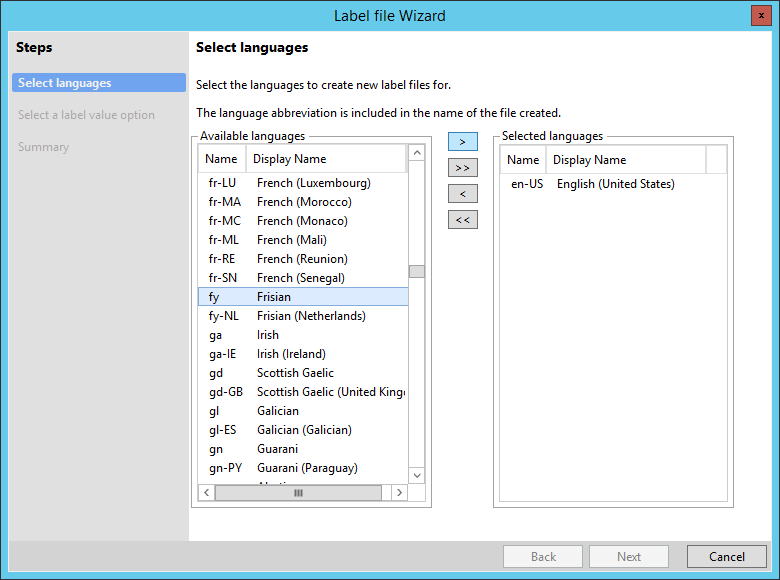 There are two ways of creating a new language in Microsoft Dynamics AX. 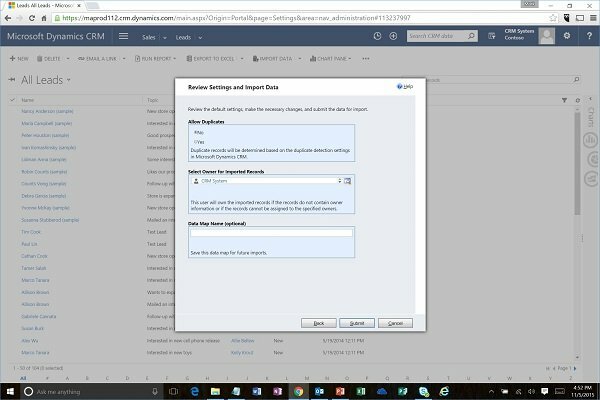 There is an option for customizing and also, as of (platform) Update 3 of Dynamics 365 for Operations, the support for extending labels. 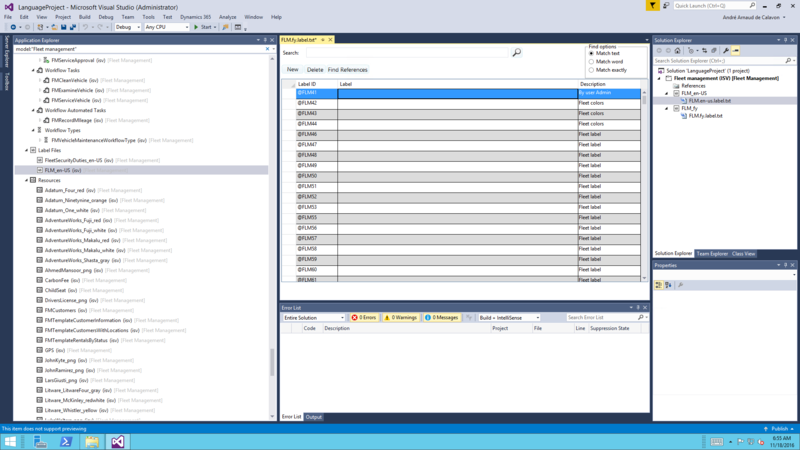 I will start with creating the new language for the Fleet management module. 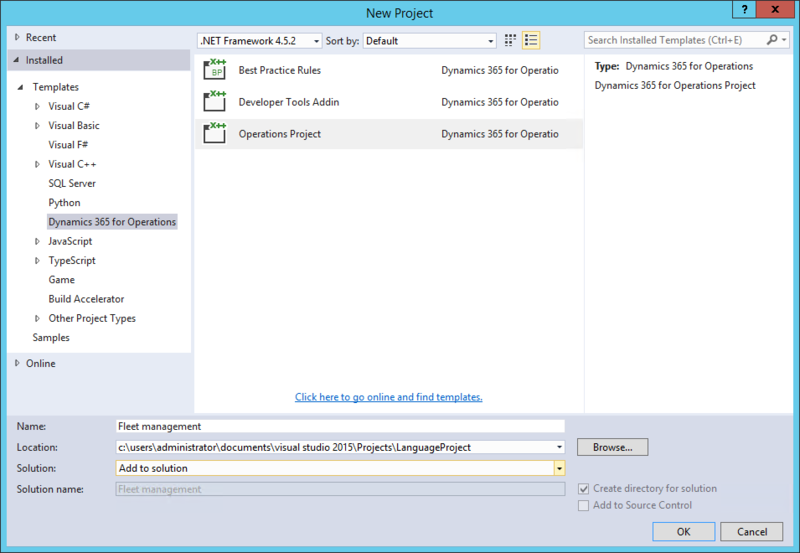 Within Visual Studio you can start with an empty solution. 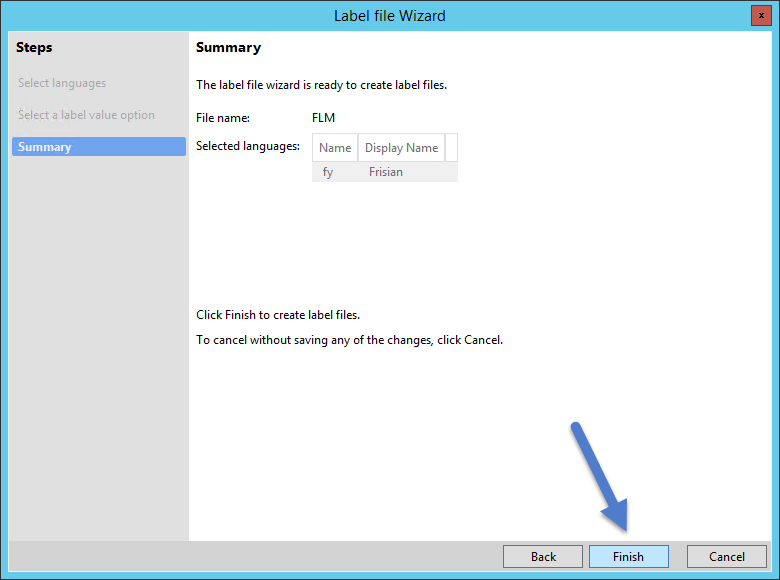 From label file(s) you can right click to activate a context menu and choose the option Add to new project. Then you will need to provide information about the project name and if it will be part of the current or a new solution. 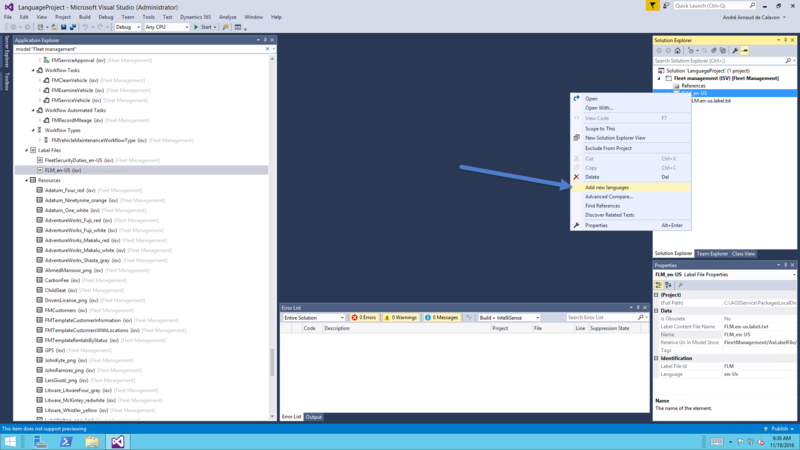 The new label object is then added to the Solution Explorer. 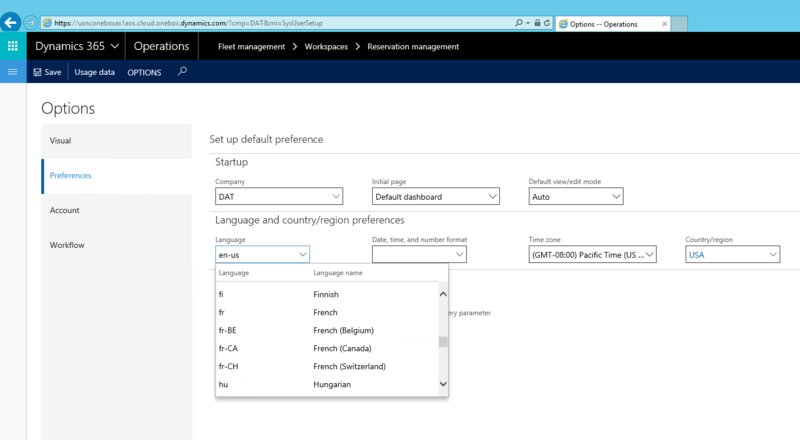 Now you can add a new language using the context menu. 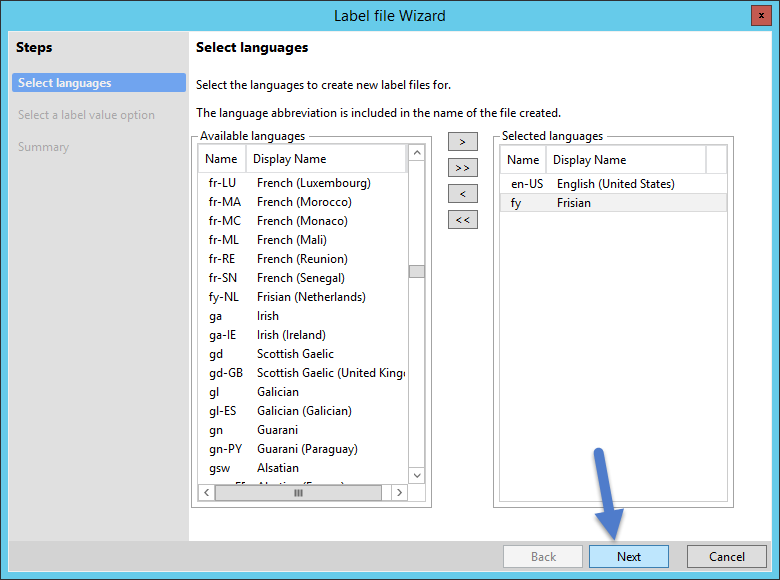 In the Label file Wizard, you can search for your language. You can eventually select more languages. When you have selected the required languages, click Next. 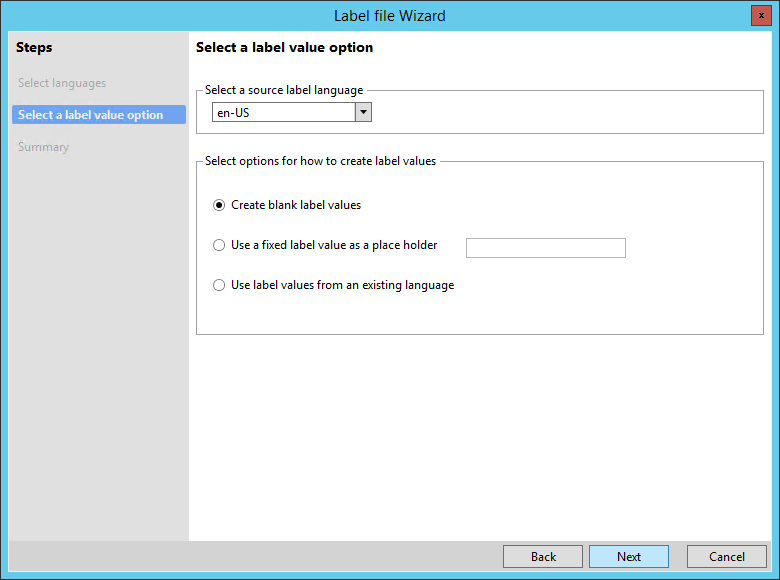 Then you have some options to have blank label values, a fixed label or use the labels of the existing language which was taken as base. In this example I had chosen for blank label values. Why I did choose this option? This will be explained below. Review the summary and click Finish to complete the creation of a new file. 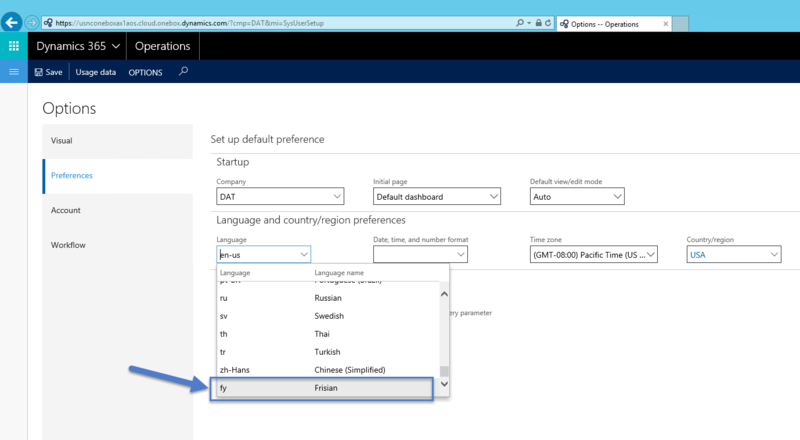 On Lifecycle services, there is a new tool released for Localization and translation. With this tool you can create a translation project. Upload a source label file in zip format and let the service translate the labels for you. I did replace the translated label (text) file in the appropriate AxLabel folder of the model and restarted Visual Studio to be able to view the New labels. The next step is building the solution and start a database synchronization. 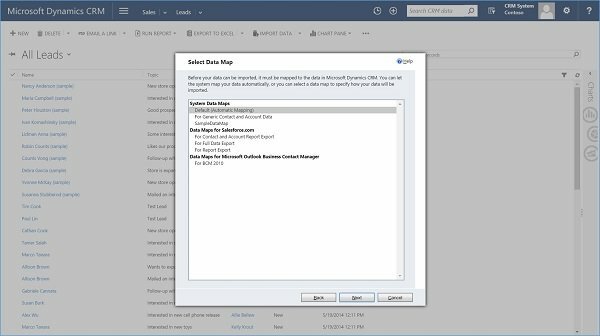 After that you can start Dynamics 365 for Operations. If you go to the (user) Options form, you can now see that the New language is selectable. 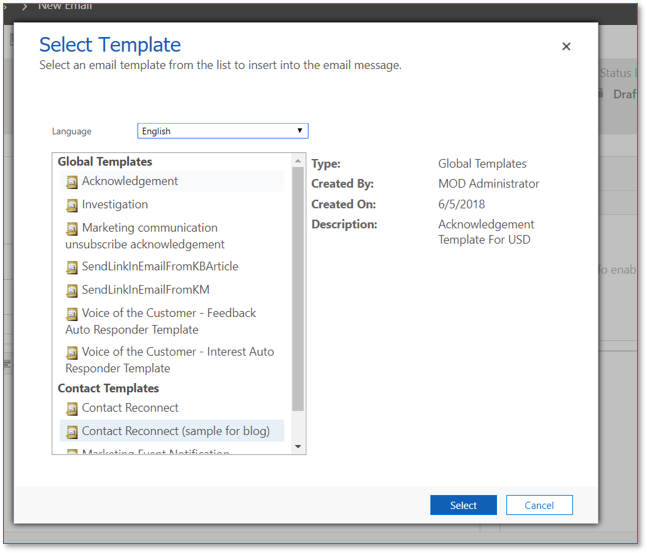 Usually we have to face the Client’s requirement of using Dynamics 365 email templates. 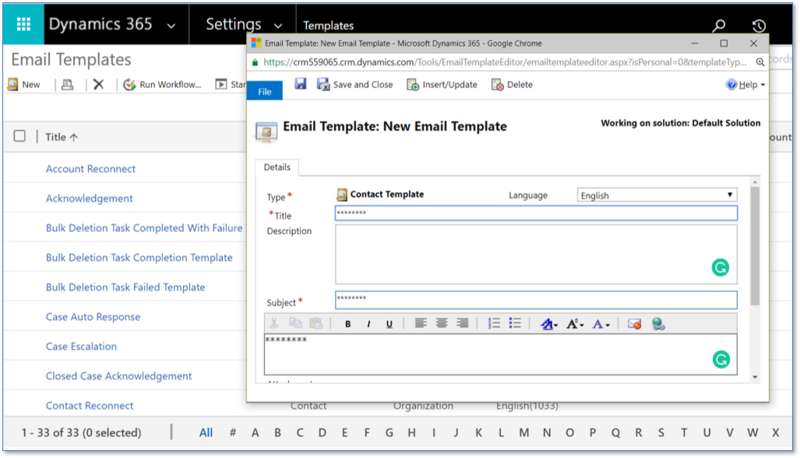 And after research I found great flexibility to take advantage of Dynamics 365 email templates. Structuring the standard email templates is a bit tricky. But with a little exercise, you can speedily create handy templates to send as one-offs or send automatically via workflow. Go to Settings > Templates. Note: Your Settings area may be locked down in which case you’ll need permission or help from an admin. Click the New button. Choose the type of email template you want, e.g., Contact, Lead, Global, etc. Create a Title for the template. This is the name you will select when you use the template. Subject: What will appear in the Subject line of the email. Body: In this basic example we’ll stick to message text, plus personalization of sender and recipient. 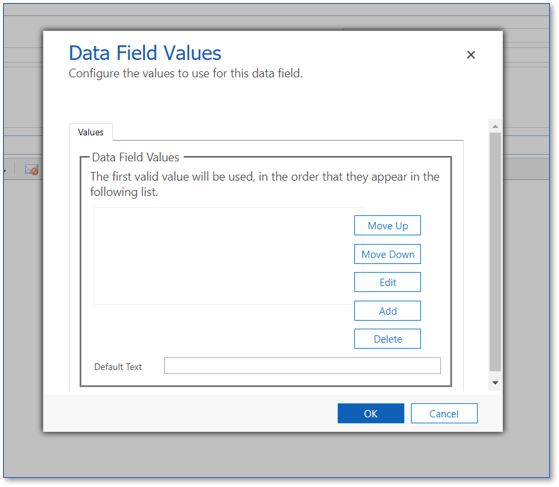 Draw the body using a combination of text, plus anything you want to auto-populate using data from Dynamics 365. 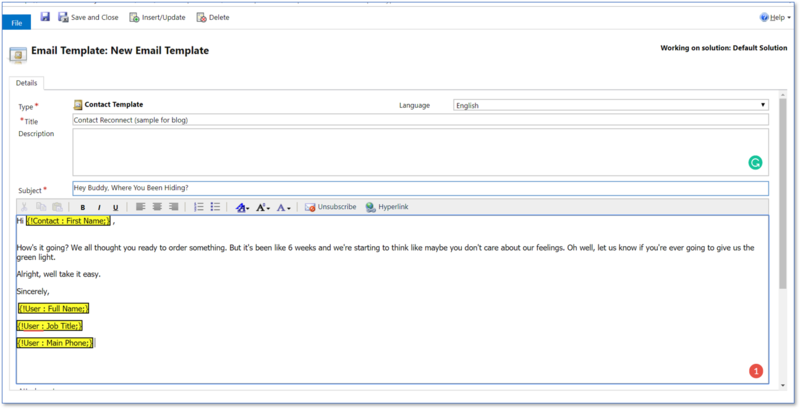 Our example template scenario is an email used as a follow up to submitting a quote. The yellow boxes correspond to personalization of the template for both the recipient and the sender. How do we add those? In the image above, you’ll see an Insert/Update button. Click on that and pull up a dialog box. 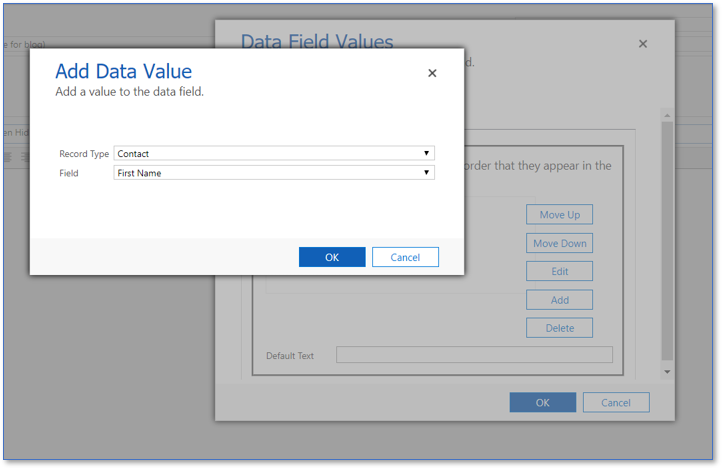 Click the Add button to choose specific data fields that will auto-populate specific areas of the template. I’m going to place the recipient’s first name in the greeting followed by a comma. And then I enter the body of the email. At the end is a signature consisting of sender (user) name, title, and phone. Signature will consist of data auto-populated from our system, just like the recipient’s first name was. The image below reflects the first draft of the email template. At first glance, it looks OK. But upon testing, we’ll see that it’s riddled with mistakes. Let’s send our template. We’ll open the Contact record of our template recipient and select Activity > Email in the timeline. Here’s where we select our template. In this case, we select “Contact reconnect (sample for blog)”. Click Send button. Note here: I’m sending the template to my own Inbox for testing purposes. This is an important step. Please don’t send your template until you’ve tested, fixed and tested again. Now let’s check at what this looks like to the recipient. The screen captures you’ll see here are from an older version of Dynamics CRM. Your system may be newer or look different but the process is similar. In this blog we’re just going to import Leads. The process for importing Contacts is very similar so if you master one you’ll be able to do the other. 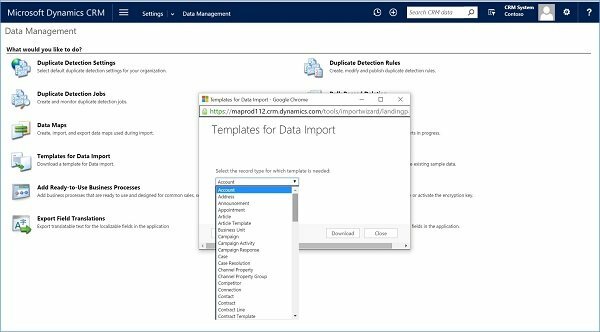 You can access import Leads functionality and templates right from your Leads view. If you couldn’t see or access the buttons from the Leads view, navigate to Settings and from there, Data Management, and Templates for Import. You’ll find templates for Leads and Contacts, in addition to templates for any number of other records. 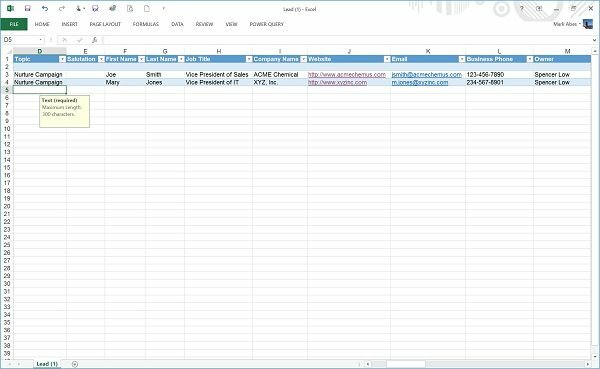 Choose the Lead template and it will download in Excel format. Open it up and you’ll see a spreadsheet with column headings conforming to the standard fields in a Lead record. I couldn’t fit all 41 columns in one slide so I typed them all into a text box in the center of the slide. 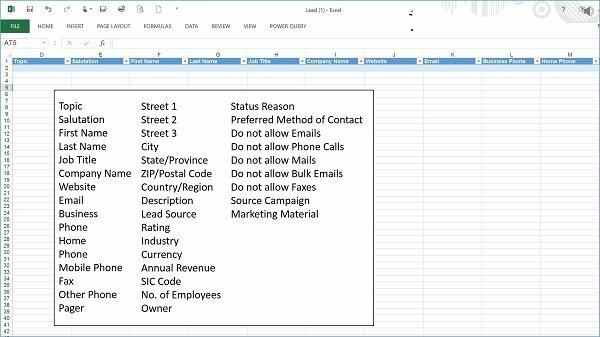 If your Lead list doesn’t include data for all the standard fields or your list has more fields than are listed, there are ways to deal with it. You can just bring in the data fields you need to do the job. For instance, if you’re running a nurture campaign that consists of an email and a follow up phone call, maybe all you need is first name, last name, phone number and email address. Keeping with this idea, I populated the template with the Lead data I need in order to run my campaign. I mentioned the idea of adding fields that are important to have in CRM. Look at the first column in this import template. Notice each cell is labeled Nurture. I want the ability to create a marketing list consisting of just these leads once they are imported, so Nurture is my unique topic that I can search on later to pull the correct Leads for the campaign. Look at the last column. I want salesperson Spencer Low to be in charge of all these leads so he is listed as the owner. This is data that I entered into the template manually so that the leads would automatically be assigned to Spencer. Save it in CSV format. Click on import data button from your Leads system view of from inside Settings. Now I’m going to choose the file I just created and saved in CSV format. We’re using the CRM template so we’ll use the default mapping. Map record type to Lead. 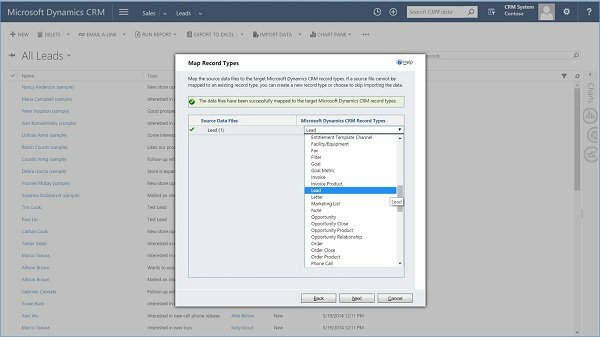 If there’s some problem mapping your data to the corresponding field in CRM, you’ll be alerted here. We look good so we’ll click next. This screen confirms that everything looks good. You can prevent or allow duplicates in the dialog box on the top. You also have the ability to save the mapping of your template for later imports. 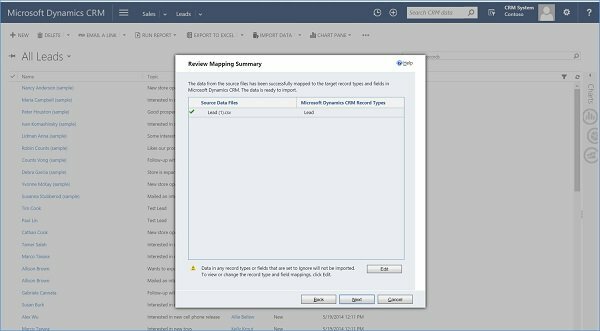 If you’re using something other than the template CRM provides, and using it on a regular basis, you can name and save the data map for the future. The import tool has done its job and you can see the 2 leads are in the system and showing as owned by Spencer Low. Let’s open one up and see what we have. All the fields that we populated in the template are populated in the Lead record. Now we can create the marketing list, send out the email blast, follow up on the phone and move this lead along the customer journey.